Already I’m keeping my eye on this developer for future use based upon my experience so far with their app, Piiig Labs. 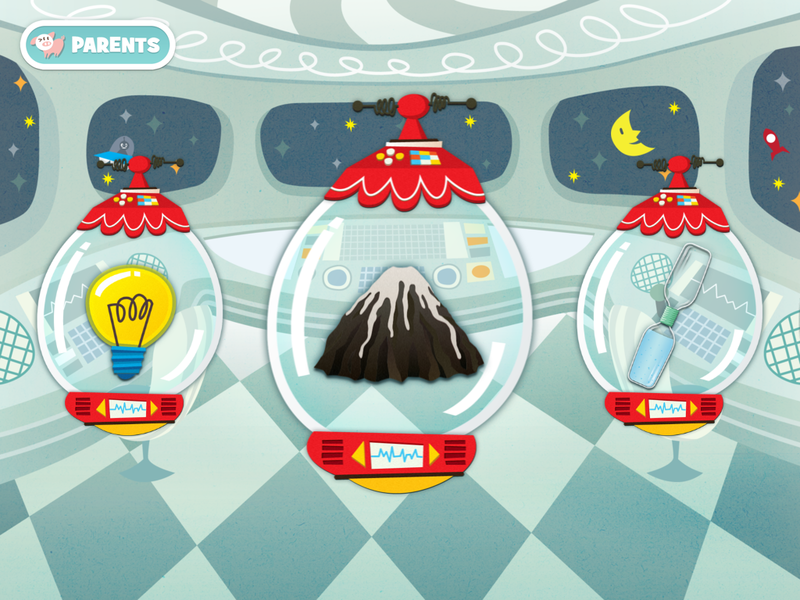 This FREE app brings classic science experiments to the touch screen in a safe (non-messy) format that gives young children an introduction to action/reaction. 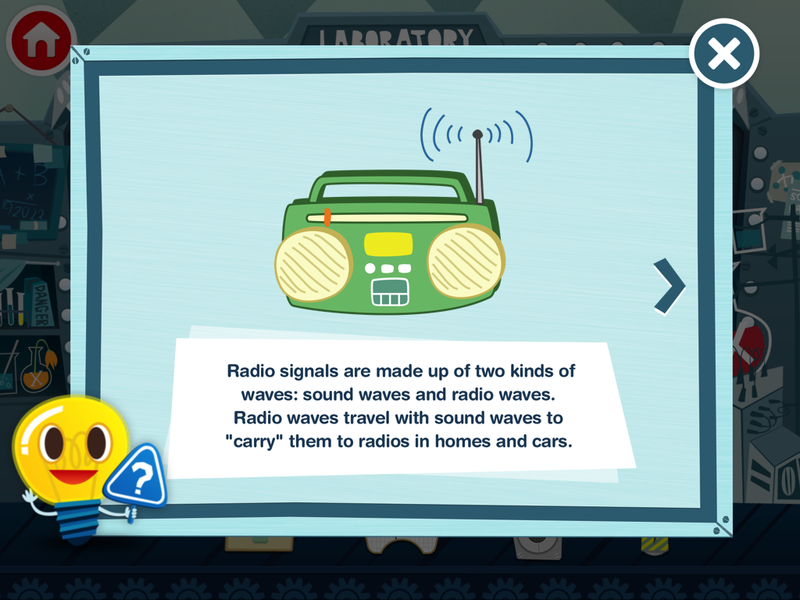 From baking soda volcanoes to an animal sound board, there are several experiments to build and explore with more “Coming Soon.” The app is rated at age 6-8, but I could easily see a 4 or 5 year old diving in no problem. 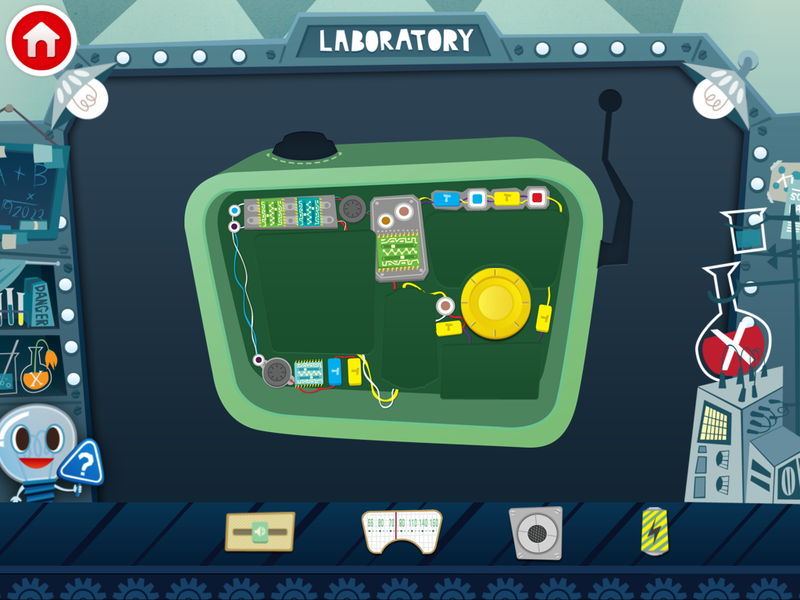 The premise of the app is that you are given ‘parts’ on a conveyor belt in their lab in order to create the selected experiment. The player has to drag and drop the pieces into their shadowed counterpart (sometimes in necessary sequence) in order for the experiment to function. One feature that stands out in my mind is when you touch a part, the app dicates what that part is (ie. “wire”, “batteries”). Can someone say vocabulary building? When the player completes the building process (with a kid-friendly user interface, mind you), the experiment comes to life, often with interactive elements. For example, I built a radio tuner (and all without electrocuting myself!). At the end, I was able to push the power button and ‘tune in’ to different broadcast stations. Granted, I wasn’t tuning into any ‘live’ radio, but it was still fun to explore. So all you maker-minded librarians and teachers, this would be a great app to integrate into some sort of STEM-based programming. Right away, I could see handing out iPads, and having the kids create a colorful baking soda volcano (that’s also in the app). Once they were finished exploring the idea, you could then demo a LIVE baking soda volcano for all to see and experience. And even if you don’t have the supplies to build a radio tuner or walkie talkie, you could still bring some in to show how they work. From my experience, this company seems to be off to a good start. Piiig Inc. has two apps in the App Store, both free and worth trying out. Stephen Tafoya works as a Technology Trainer for a library district, and he partners with Youth Services Coordinators to engage kids and teens with technology in library programming. Posted on February 20, 2014, in Literacy. Bookmark the permalink. 5 Comments. The app isn’t free, I just checked. It’s selling for $2.99. Hi all! Yes, it would appear that the app is no longer free. I wonder if we might get some promo codes from the developer that our Promo Code Fairy might be able to give out! Hi Cen, I’m the creator behind Piiig Labs and would love to participate in the Promo Code Fairy! How do I sign up? Just downloaded this thanks to the code from the Promo Code Fairy! It looks like it will be great for use on our school-age and preschool iPads.